It also cut guidance for the rest of the year. The stock has fallen 16% in Tuesday’s trading day. You could tell because analysts kept asking about it over and over again on the earnings call. It had to do with Valeant’s new agreement to sell drugs primarily through Walgreen’s. The problem is simple to explain, but hard to correct. Valeant isn’t getting nearly as much as it expected for the drugs it’s selling through Walgreen’s. Average sales price (ASP) is way down. In fact, sometimes Valeant is seeing negative average sales prices, and it doesn’t seem like management is totally clear on how to fix that. “We’re excited about the Walgreens program… the program as you know is very innovative. It’s a 20-year program and naturally when you put something together that is innovative you’re going to experience some speed bumps,” new CEO Joe Papa said on the call. 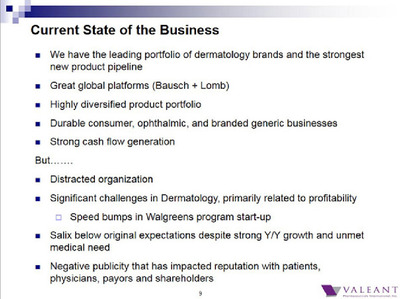 Valeant didn’t have “speed bumps” with sales before because, for a while, it had its own private specialty pharmacy. It was called Philidor, and its very existence was unknown until October, when a short seller pointed out some shady activity going on with Valeant’s accounting. That, combined with government scrutiny over its pricing practices, brought Valeant’s stock crashing down 90%. Valeant PharmaceuticalsThis is what Valeant has to do. And it brought about the end of Philidor. The government is still investigating why Philidor employees were told to use other pharmacies’ identification numbers to push through sales with payers; why Valeant purchased the option to buy Philidor for $100 million; why Valeant employees worked at Philidor using fake names. Basically it’s a mess — the kind of mess that turns off the doctors who have to prescribe Valeant drugs, and the payers who have to pay for them. 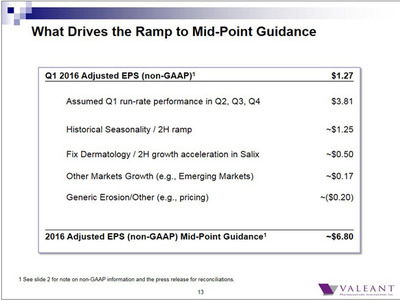 Valeant says it’s working to rebuild those relationships, but that takes time. In the meantime, without Philidor segments of Valeant’s business were left without the support of a distribution channel that pushed through sales. 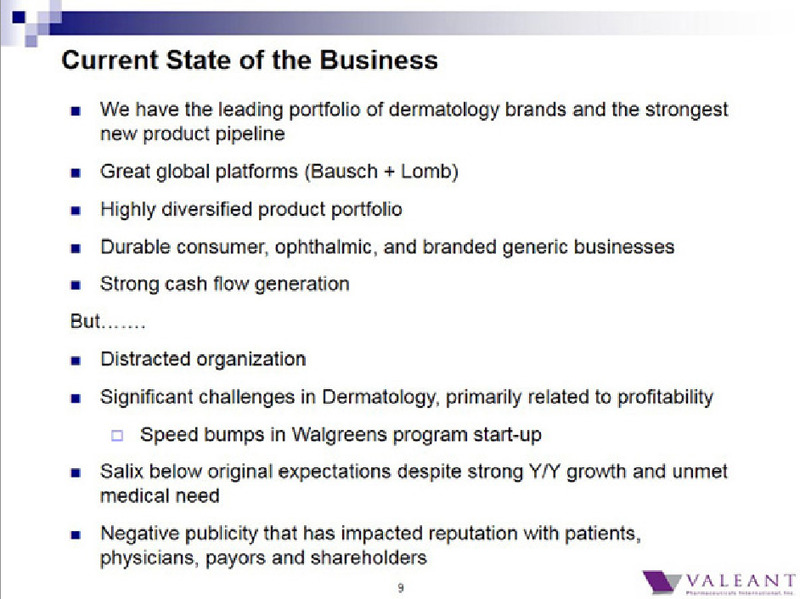 This has been a huge problem for the dermatology unit, which represented 21% of Valeant’s US revenue, according to Morgan Stanley. In December, Valeant struck this primary sales deal with Walgreen’s, but Walgreen’s is no Philidor. First off, patients did not have their prescriptions automatically switched from Philidor to Walgreen’s. Some patients had to obtain new Rx’s from their physicians in order for Walgreens to dispense refills. This contributed to early 2016 disruptions and resulted in some lost prescriptions because some physicians elected to prescribe non-Valeant medications. Remember, some doctors are none-too-pleased with Valeant. The other problem has to do with process. If you’re paying cash for a Valeant drug at Walgreen’s, you’re good. If you’re a commercially covered patient, then you should be good if Valeant drugs are covered by your healthcare provider. But, when the drugs require prior authorization before disbursement from your provider — that’s where Valeant is running into problems. ValeantSales of Xifaxin need to jump by $183 million. 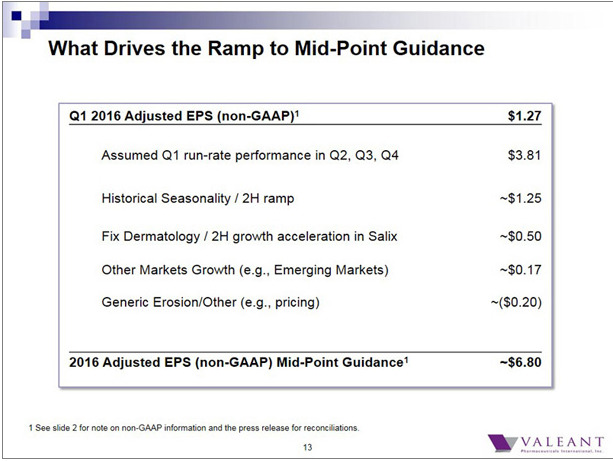 That’s where Valeant is getting into “negative APS,” which alarmed many an analyst on the Tuesday call. What’s more, Morgan Stanley noted that dermatology sales aren’t going up — they’re actually levelling off since Valeant started it’s program with Walgreen’s. 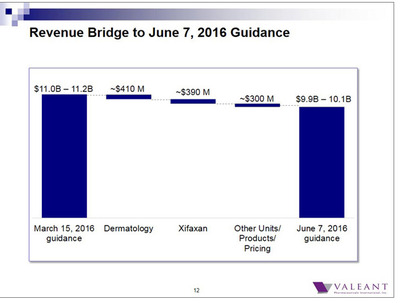 “According to our VRX derm tracker, derm scripts appeared to peak at close to 100,000 in February 2016 and fell below 90,000 in April. We observe a recent uptick to approximately 91,000 in the most recent week,” Risinger wrote in the note dated June 1. We should note that on the call Valeant executives said that negative average sales prices did not impact the service fees it pays to Walgreen’s. This problem isn’t just impacting dermatology either. On the call one Valeant executive mentioned that this was also impacting the company’s crown jewel, Xifaxin. It was expected to be a $1 billion drug in 2016, but in Q1 it only hauled $207 million in revenue. In order to gain more distributors for the drug, Valeant had to settle for lower prices. Executives blamed “disruption workforce turnover changes in leadership” (the head of Xifaxin’s division left Valeant earlier this year) and “enrollment in high deductible plans.” On that latter point, it just seems patients don’t think this $1 billion irritable bowel syndrome drug is worth their co-pay. Papa and his crew framed this low ASP problem as totally solvable on the call. On the one hand, they explained that company is working hard to regain its standing with doctors and payers. On the other hand, Papa tried to describe negative ASP incidents as technical glitches. “We now have the data to look at that, and now we know which patients and issues we can address. We can work more closely with Walgreen’s to fix it,” he said. ValeantThis is how Valeant makes it back to OK.
Morgan Stanley agreed with that. Yes, the company needs to know which payers will actually pay for it’s drugs. But is also has to actually make its new business model of selling a higher volume of drugs at lower prices actually work. “We believe Valeant is evaluating which drugs to put into the program and how to manage reimbursement coding, so that when it offers brands at generic prices it does not cause peripheral pricing risk to branded drug reimbursement. For example, we believe Valeant may need to limit the program to select branded drugs which already have an extremely low Medicaid best price which would not be a risk of re-setting lower,” Risinger wrote. In other words, Valeant should only try to sell it’s already cheap drugs, cheaply. And a lot of them. Like, a whole, whole lot of them. Valeant says that it’s going to be working with independent pharmacies, giving them coupons to sell products in June. The company expects generic competition for two of its most controversial drugs, Nitropress and Isuprel, to hit the market within the next 6-12 months. Valeant would not answer questions about what information the SEC has subpoenaed from it.